The amputation of Angela’s leg was a result of a blood clot formed behind her knee, believed to be due to medication prescribed for a misdiagnosed condition. Angela, a single mom of three and full time worker had health insurance through her employer, however the policy contained a clause excluding coverage for microprocessor parts. 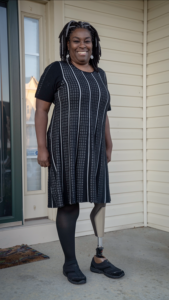 With a retail price tag in the $28,000 range, the microprocessor knee that Angela needed to live her life was simply out of reach for her from a financial standpoint, as it would be for so many. Just weeks after she got her C-leg, Angela began training to become an amputee peer counselor with plans to “pay it forward”. She hopes to provide light for someone else who is going through a dark time and feels that with her new C-leg, she’s able to do just that!